Mack Trucks’ leading refuse vehicle, the Mack LR model, now offers improved safety and driver productivity features for its customers. Mack made the announcement at Canadian Waste and Recycling Expo, Oct. 24 to 25 at the Enercare Center, Toronto. Mack Trucks' leading refuse vehicle, the Mack LR model, now offers improved safety and driver productivity features for its customers. Mack made the announcement at Canadian Waste and Recycling Expo, Oct. 24 to 25 at the Enercare Center, Toronto. A passenger side sliding glass window for increased visibility, and Sears C2 PLUS air suspension seat for enhanced driver comfort, are now standard on the LR model and available for order. Mack also announced that an exterior stainless steel sun visor and 315 series tire coverage for the Hendrickson HAULMAAX suspension are now available for order. The new sliding glass window improves ventilation and allows easy access to the passenger side mirror during right-hand stand-up or sit-down operation. The exterior stainless steel sun visor, available as an option, improves heat deflection and reduces glare, while standing up to harsh refuse operating conditions. The Sears Seating C2 PLUS air suspension seat offers an even more comfortable ride, while a Sears Seating multi-position right-hand seat is standard for customers who spec right-hand operation LR models. The multi-position seat, engineered exclusively for the Mack LR, enables more adjustability for right-hand operators whether standing or sitting, as both the seat back and seat base are adjustable, according to the manufacturer. Spec'ing the Mack Granite, Mack TerraPro and LR models with 315 series tires in all wheel positions greatly simplifies the ordering process for customers and enables them to more efficiently manage their tire programs. Also now available for order on Mack LR and TerraPro models is TMC RP170A, a set of chassis-to-body electrical interface guidelines for refuse trucks. The electrical interface was developed through industry collaboration by the American Trucking Associations' Technology & Maintenance Council (TMC), and allows for easier upfit, standardization and ease of troubleshooting and maintenance. 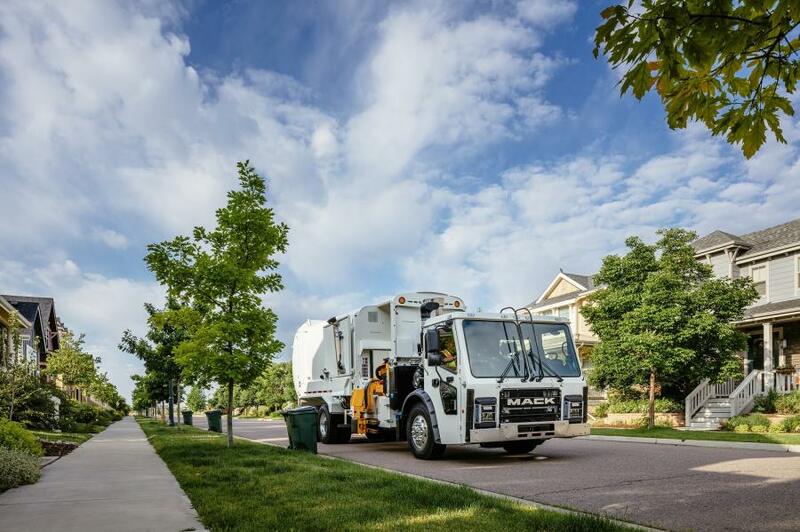 The Mack LR was designed to meet the challenges of refuse customers needing superior maneuverability, increased productivity and improved visibility, and is available in 6x4 and 4x2 configurations. Customers can specify left-hand drive, right-hand drive, dual-drive and left-hand drive with right-hand stand-up/sit down drive. Mack's 11-liter MP7 diesel engine is standard in the LR model, delivering up to 355 hp and 1,260 lb.-ft. of torque. The LR is equipped with an Allison RDS five-speed or six-speed automatic transmission.